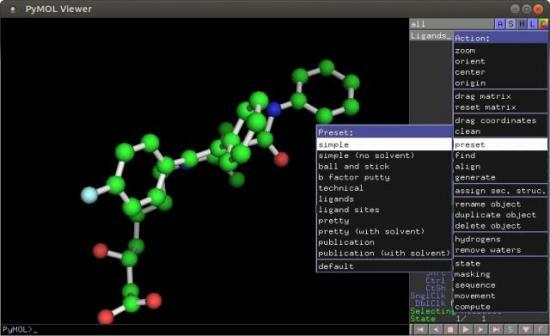 Introducing PyMOL, a Python package for studying chemical structures. I've looked at several open-source packages for computational chemistry in the past, but in this article, I cover a package written in Python called PyMOL. 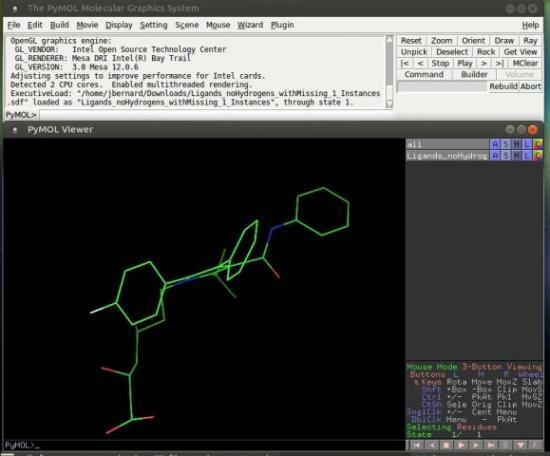 PyMOL is a very powerful program, used for visualizing and analyzing chemical structures. Although the main project is an open-source one, a commercial version is available that provides support for those who need it. There are several installation options, but I actually suggest that you don't install it directly from the available downloads. You first will need to install a rather large number of dependencies, which may lead you to dependency hell. So, if the package manager for your particular distribution includes a package for PyMOL, it probably will be much easier to use it, especially when you are just learning how to use PyMOL. As I've mentioned and is obvious from the name, PyMOL is written in Python, and it also uses 3D libraries to handle the actual image rendering. PyMOL also is written with a plugin architecture, which means you can expand PyMOL's feature set to handle new analysis workflows. When you first start PyMOL, two windows will open (Figure 1). The first is a console window where you will be able to interact with PyMOL programmatically. The second window is the actual viewer for the results of the visualization and analysis of your chemistry problem. Figure 1. When you first start up PyMOL, you get both a console window and a viewer window. The most basic usage is as a regular viewer of chemical structures. In order to do that, click the File→Open menu item to pop up a dialog window where you can select the file to open (Figure 2). Figure 2. 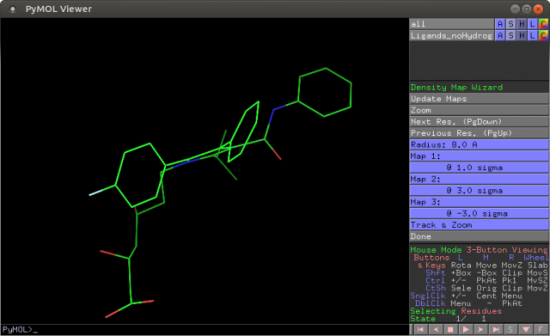 Opening a PDB file renders the molecule within the viewer window. PyMOL can handle several dozen different file formats. If you don't have any input files of your own yet, you can get PDB files from the RCSB Protein Data Bank in order to explore PyMOL and see what you can do with it. When it opens, you will get the default view of the molecule as a stick figure. Within the viewer window, there are three panes. The left-hand pane contains the actual rendered image. On the right-hand side, there are two smaller panes. The bottom half has a description of mouse actions you can use to manipulate the molecule in the viewer. You can rotate the image, zoom in and out, and control clipping and selection of the objects rendered within the viewing pane. The top half is the object control panel. It contains a list of all of the objects that are being worked with in the current session. Each object in the list has a series of buttons that can apply functions to that object. There is one special entry at the top of the list that affects all of the objects together. The first button, labeled "A", is a set of actions you can apply to selected objects. These actions include things like using presets for viewing options or even initiating calculations (Figure 3). Figure 3. A number of presets are available to make visualization easy. You can alter several other view options of the display through the action menu. The "S" and "H" buttons provide menus of which elements to show and which elements to hide. The "L" button lets you set what gets labeled within the viewer, and the "C" button lets you play with how colors are used within the rendering. You also have the option of changing the viewing elements directly within the viewing pane by right-clicking in the viewer. When you do, you get a drop-down menu that allows you to change the zoom, the orientation and what objects are visible, among many other options. With so many settings to change, you may find yourself in a situation where you can't see the relevant objects anymore, or you may not be able to undo the changes you have made effectively. In those situations, you can right-click the viewer and select the Reset entry to start over from the beginning. For more complex interactions, a number of wizards are available from the Wizards menu item to help you coordinate these types of interactions. For example, you could work with density maps by clicking the Density option (Figure 4). This gives you a set of tools within the right-hand pane where you can change settings around the density mapping functionality. Figure 4. There are wizards to help you with more complex tasks, such as working with density maps. There is also a suite of plugins, which can add extra features to PyMOL. Go to Plugin→Plugin Manager for a new window where you can work with those plugins (Figure 5). Figure 5. The plugin manager allows you install, remove and configure your PyMOL plugins. Clicking the "Install New Plugin" tab provides a few options of how to install your new plugin. The first option allows you to install directly from a file stored on your local filesystem. The second option is to install a plugin from the PyMOL Wiki, and you can enter a URL pointing to a plugin described on one of the Wiki pages. 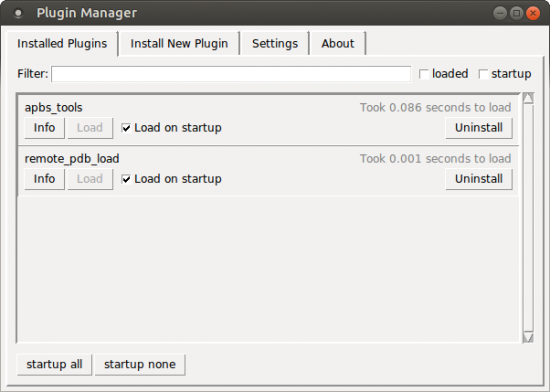 The third option is to select and install a plugin from one of the available repositories of plugins. When you select one of the repositories from the list, the available plugin list will be populated, and you simply can select the plugin you need from that list. Although you can write your own full-fledged plugins, you also can add your own customized functionality much more easily by using scripts. PyMOL includes a command language of its own that you can use directly within the console window. These include simple commands, like loading files or saving images, and more complex commands, such as doing fits between two molecules. Along with these built-in commands, you also have access to a full Python interpreter underneath the hood. This means you can write Python scripts that work with these commands and the objects within your PyMOL session to do even more complex tasks. Once you have your task figured out, you can save your work within a script file that you can reload later and apply within a different session. The PyMOL Wiki also hosts a script library, and it's a good place to look before you start down the road of creating your own script, as someone else may have run into the same issue and may have found a solution you can use. If nothing else, you may be able to find a script that could serve as a starting point for your own particular problem. When you're are done working with PyMOL, there are many different ways to end the session. If there is work you are likely to pick up again and continue with, click File→Save Session to save all of the work you just did, including all of the transitions applied to the view. If the changes you made were actually structural, rather than just superficial changes to the way the molecule looked, you can save those structural changes by selecting File→Save Molecule. This allows you to write out the new molecule to a chemical file format, such as a PDB file. If you need output for publications or presentations, a few different options are available. Clicking File→Save Image As allows you to select from saving a regular image file in PNG format or writing out data in a POVRay or VRML 3D file format. If you are doing a fancier presentation, you even can export a movie of your molecule by clicking File→Save Movie As. This lets you generate an MPEG movie file that can be used either on a web-based journal or within a slide deck for a presentation.